Chocolate Fondue - Eat. Drink. Love. Ok, I have been so bad with posting lately! I am currently out-of-state visiting family for the week, but I didn’t want to go a whole week without any updates! It was my good friend, Amanda’s, birthday last week and I wanted to celebrate with a special treat, but I didn’t want to do cake or cupcakes. Chocolate fondue was the perfect choice because it’s perfectly decadent and easy to make! This is my go-to chocolate fondue recipe that I always use for our fondue feasts! It’s great because you can easily change up the ingredients, for example, the chocolate. You can use semi-sweet chips, but you can also use milk chocolate or dark chocolate chips! If you want to make this fondue extra special, try adding in some melted peanut butter or some seedless raspberry jam! When it comes to choosing what to dip, I like to do pound cake, strawberries, and bananas. But, if you want to do it up Melting Pot style, add some brownies, cheesecake, and rice krispie treats! – For Dipping: pound cake, strawberries, sliced bananas, brownies, rice krispie treats, etc.! 1. Heat fondue pot to high heat. Add the cream and stir in the vanilla extract and cinnamon. Once heated, add about half the bag of chocolate chips and stir until melted. Add rest of the bag and continue stirring until smooth. Lower heat and enjoy! I love chocolate fondue! The cheese one is pretty darn good too. Such an adult treat that is really easy in the end. And fun to eat too! Yum! 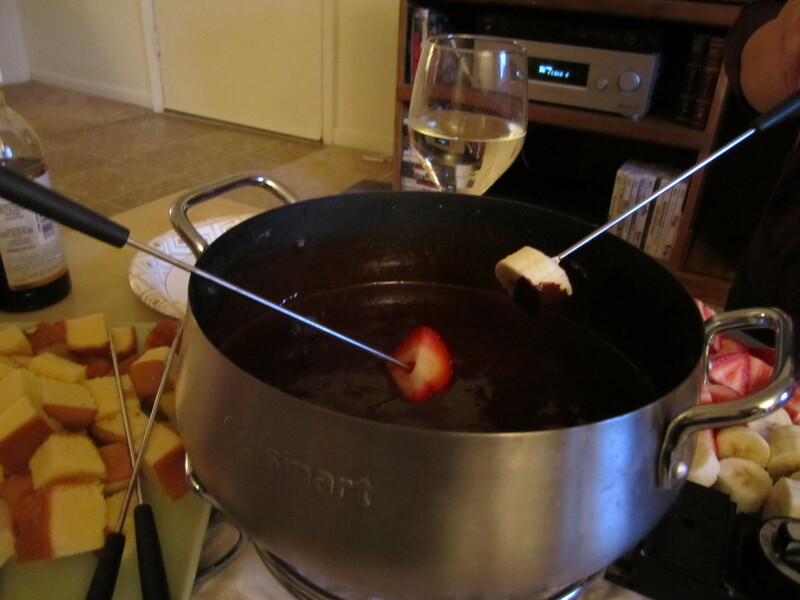 Chocolate fondue can absolutely MAKE a party! I love making fondue for our game nights. It’s easy and people can pick at it all night since I took your suggestion and got an electric non-stick fondue pot. I also love to dip pretzel rivets into cheese or chocolate fondue. mmmmmmm, pretzels in cheese and chocolate sounds perfect! Will have to try that next time!